Uneven skin tone and rough texture can make your skin look old and lackluster. This can be caused from years of having active acne, sun damage, poor diet, or simply the natural aging process. Pearl Laser Resurfacing and Fraxel Fractional are two skin treatment options designed to address brown spots, acne scars, wrinkles and uneven skin tone and texture. The biggest difference between the two technologies is in their performance. Pearl Resurfacing treats the entire top layers of skin as well as deeper layers whereas Fraxel Fractional laser only treats a “fraction” of the problem. 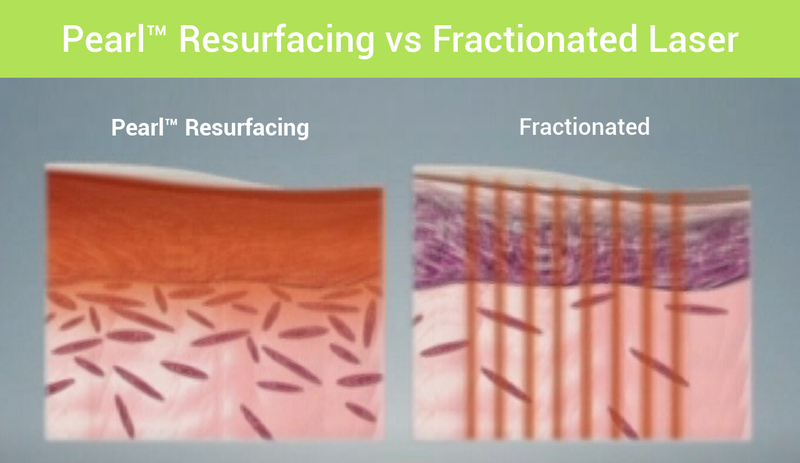 Since Fraxel and other Fractionated lasers can only treat a fraction at a time through tiny “zones” emitted in the skin, it requires at least four to five sessions to see a difference. Whereas Pearl Resurfacing treats the entire area at a time providing dramatic results with one session. In Cutis Laser Clinics, we use Pearl Resurfacing Laser because of its wide range of benefits such as shorter downtime of three to five days yet giving a noticeable difference. Learn more why we prefer Pearl Laser Resurfacing to give our patients a beautiful and pearly glow. Pearl is a US FDA-cleared procedure as it combines the effectiveness of resurfacing lasers with the safe and gentle properties of a non-invasive procedure to remove wrinkles, superficial scars, freckles, and sun damage. Pearl is an also a non-ablative device, meaning it does not destroy cells within the epidermis which allows a shorter downtime compared to other fractionated lasers. No other treatment can offer an overall rejuvenation in less than 1 week. During the treatment, Pearl treats the top layer of skin using pulses of light emitted in a pre-selected pattern. The laser then sends heat to the deeper tissues under the skin’s surface generating collagen production resulting in a smoother outcome. Also, to make the treatment more comfortable, numbing creams will be used before the start of the procedure. The skin will immediately form a natural protective dressing that helps minimize downtime and jumpstart the skin restoration process. This will then peel off after three to five days which reveals a brighter, healthier and more radiant skin. Acne scars, wrinkles, and pigmentation on a face are also noticeably reduced in as little as one treatment. It’s normal for your skin to feel tight and look “sunburned” after your Pearl procedure. The skin will usually start sloughing or peeling off on day 3 or 4, but you are advised not to pick, rub or scrub your skin but allow it to slough off on its own after a week. This will also help to avoid any irritation while your skin is healing. During this time, your skin will also be sensitive to the sun which is why you will be asked to wear a hat or avoid any exposure to the sunlight. You will also be provided with a complete post care instructions by our aesthetic doctor, Dr. Sylvia Ramirez after your Pearl treatment. This treatment for hyperpigmentation can also be combined with other non-invasive treatments to address other skin concerns. Pearl Resurfacing can be safely combined with Laser Genesis, an FDA-cleared laser treatment that reduces the inflammation and helps heal potential scarring from acne. This treatment also reduces pores and works to improve the texture of your skin by stimulating collagen growth with repeated treatments. If you’re in search of a non-invasive way to treat wrinkles, fine lines, uneven skin texture, or similar problems, you may want to consider Pearl Resurfacing available at the Cutis Laser Clinic in Singapore. If you have questions or would like to schedule an appointment with our aesthetic doctor, Dr. Sylvia Ramirez, please contact Cutis Laser Clinics in Singapore today.